Happy New Year to you. I’m pleased to be writing my second post for our blog, which since launching last year has been successful in keeping you up to date with exciting projects in the pipeline, grants awarded to inspiring local charities and voluntary groups, and generally sharing knowledge. I am delighted to report, with grateful thanks to our growing family of local Donors, that we’ve awarded over £1.3 million in grants to voluntary groups and disadvantaged individuals this financial year so far. 2018 also saw the launch of our Surrey Mental Health Fund, which has just recently awarded over £50,000 to local projects supporting children and young people to fight the challenge of mental health issues, with another round of funding to be distributed later this year. 2019 promises to be another exciting year for the Foundation. 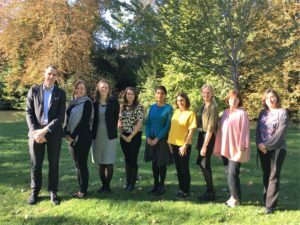 With three new talented Trustees on board, and an excellent staff team in place, we have set ourselves ambitious targets for growth. It is a critical time for the voluntary sector, with public funding drastically reducing and charities across the county feeling the pressure of increased demand. Our role is even more vital, in unlocking resources which will allow these local groups to make a huge impact on people’s lives in Surrey. I am currently writing an exciting new Business Plan that embodies our ambition to build on our current successes, and that will drive us forward to support even more local communities across the county, both today and in perpetuity. We are looking forward to working with new and existing Donors and to really seeing the power of local philanthropy recognised here in Surrey. We are ambitious in our approach and focus our energy on building significant, sustainable funds for local communities, both now and in the long-term. We are professional, working with integrity, transparency and efficiency. We are an approachable and supportive grant-funder, with a heart firmly rooted in our community. We collaborate with local donors and local voluntary groups to empower positive and sustainable change. We are pro-active and take a positive and creative approach, using our knowledge to realise the power of philanthropy. Our full Mission Statement and Values can be found here. Last year we received our highest number of applications to date, with sadly once again over £1 million of requests that we were unable to fund. This level of unmet need is what motivates us to continue our work to encourage local philanthropy and urge people to be part of the solution. I hope that you have enjoyed reading our blog posts over this past year, and that you continue to enjoy learning about our incredible supporters and the charities that are working with us to make Surrey a better place. Please do keep following our posts, as we have some exciting content planned for this new year. You can also follow us on Twitter, Facebook and LinkedIn by liking and sharing our posts, and please don’t forget that, if you would like to stay up to date with our work, activities and grant funding information, you can do so by signing up to our newsletter here. If you would like to find out more about how you can get involved, please call us on 01483 478092. We would love to hear from you!